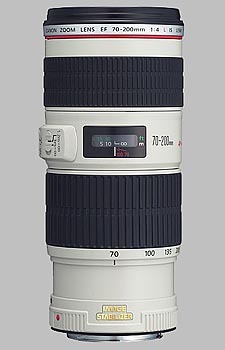 (From Canon lens literature) The EF 70-200mm f/4L IS USM is a lightweight, compact L Series telephoto zoom lens with Image Stabilizer. The optical Image Stabilization in the new EF 70-200mm f/4L IS USM lens provides up to an incredible four stops of shake correction - a first for Canon IS lenses. The use of fluorite UD lens elements provides excellent optical performance in terms of resolution and contrast. These features, together with its water-and dust-proof construction, provide both the performance and portability to meet user demands. Note: IS test results available! We've measured this lens' IS performance, read the results here! If you haven't already perused the SLRgear blur plot Viewer that accompanies each SLRgear lens review, now would be an excellent time to study the blur plots for the Canon 70-200mm f/4L IS lens. When you click on the blur plot thumbnail just below the Blur Index caption on the right side of the screen, the viewer opens with the blur plot for the 70mm-f/4 focal length-aperture pair. Also shown is a vertical slider which controls the aperture and a horizontal slider which selects the focal length. If you move the vertical slide upwards, the blur plots for f/5.6, 8, etc., display. As you move the horizontal slider to the right, the blur plots for 70mm, 100mm, 135mm, and 200mm display. Perhaps the most interesting feature of the blur plots for the Canon 70-200mm f/4L IS is the almost uniform flatness across the entire focal length-aperture spectrum. This demonstrates that this lens has no corner softness (relative to the center), period. And the "dark blueness" of the plots for apertures f/4 through f/16 at all focal lengths indicates a lens with sharp-flat images. Even at f/22 and f/32 (where diffraction degrades the image) the plots remain relatively flat. Now that you have played with the Blur Plot Viewer, the discussion in the next three sections will confirm and extend these first observations a bit. Figure 1 below is a graph of the Center Sharpness in the range f/4-32 for focal lengths of 70mm, 100mm, 135mm, and 200mm. As indicated, these results were obtained with the lens mounted on the Canon 20D. The curves are strikingly "the same", very unusual in our testing experience: Usually we find that zooms are noticeably better at one end of their focal length range than the other, it's exceedingly rare to find a lens that's equally good no matter the zoom setting. If we employ DxO's characterization of "Sharp" for blur indices in the range 0.5-1.5, then this lens is sharp from f/4 to f/11 at all focal lengths. It's borderline sharp at f/16 (where diffraction effects are beginning to show on the 20D). At f/22, blur values of about 2.2 are considered "Soft" in the DxO rating. The smaller pixels of the 20D amplify the diffraction effects at f/32 where blur indices of about 3.5 rate a DxO classification of "Blur Visible" for all focal lengths. The "pixel-size effect" on diffraction is demonstrated below on Figure2 which presents the corresponding Canon 5D results. The full-frame 5D with its larger pixels demonstrates the effect of increased pixel size on the tendency of diffraction to degrade sharpness at higher apertures. At f/16, where diffraction effects are just becoming noticeable, the 5D blur index for each focal length is "Sharp" ("borderline Sharp" for the 20D). At f/22, the 5D-indices are in a 1.7-1.9 range while the 20D values fall in a 2.1-2.3 range. Finally, the f/32 values for the 5D are between 2.8 and 3.0 while the 20D values lie between 3.3 and 4.1. The center sharpness of the Canon 70-200mm f/4L IS lens on the both the 20D and 5D is excellent at all focal lengths. Figure 3 shows the average corner sharpness for the same aperture-focal length range of Figure 1. Just as with Center Sharpness these curves are strikingly similar, with a relatively minor spread (less than 0.5 Blur units) at f/4. Even the corners are rated "Sharp" for f/4 through f/11. At f/16, the corners are just in the transition region between "Sharp" and "Soft" ratings. The corners are "Soft" for f/22 and "Visibly blurred" at f/32. Once again, diffraction and the relatively small pixels in the 20D combine to degrade the smaller-aperture images. Figure 4 (below) displays Corner Sharpness for the Canon 70-200 f/4L IS mounted on the Canon 5D. A quick inspection of the f/16-32 portions of Figures 3 and 4 again reveals how the larger 5D-pixels increasingly diminish the diffraction effects for these apertures. Figure 5 is, perhaps, the best demonstration of how well the larger 5D pixels "control" diffraction effects relative to the smaller 20D pixels. Each of the seven points on the 20D (black) curve of Figure 5 is the average over all four focal lengths (70mm, 100mm, 135mm, 200mm) of the blur values for the specified f/-value. The red curve points are the correspondingly-averaged values for the 5D. The two curves are essentially identical for f/4-11. At f/16 where diffraction effects are becoming noticeable, the 5D is slightly less affected by them relative to the 20D. And this difference grows at f/22 and f/32 where the decreasing aperture diameter is increasing the diffraction effects. The corner sharpness of the Canon 70-200mm f/4L IS lens on the both the 20D and 5D is excellent at all focal lengths. If you haven't already done so, take a moment to peruse the Chromatic Aberration graphs provided on the right side of the 70-200 f/4L IS's home page. As you move the slider from 70mm through 200mm, you might notice that both the Maximum CA and Average CA are well behaved. The average CA over the entire aperture-focal range varies between 1 and 3 DxO units while the Maximum CA is contained in a 2-5 range of values. These values are neither particularly low nor high. The Chromatic Aberration for the Canon 70-200mm f/4L IS lens on both the 20D and 5D is probably best characterized as Average. Figure 6 (above) summarizes the CA performance for the Canon 70-200mm f/4L IS on both the 20D and the 5D. As before, each point on either of the curves is the average for that f-stop over the four focal lengths used in this report. The graph reveals a slightly better CA performance on the 5D relative to the 20D. But, overall, a CA rating of "Average" for this lens remains appropriate. Figure 7 (below) summarizes the Condensed (averaged over all focal lengths) Shading performance for the Canon 70-200mm f/4L IS on both the 20D and 5D. As expected, the full-frame sensor of the 5D sees the outermost portions of the image from the lens and, in this region the light intensity decreases more noticeably (shading increases). Other than the slightly higher than usual 5D performance in the f/8-32 range, the Shading performance of the Canon 70-200mm f/4L IS lens is typical. That said, Shading for this lens is probably not significant for normal use. Figure 8 shows the measured Distortion values for the Canon 70-200mm f/4L IS measured on both the Canon 20D and Canon 5D. The lens displays barrel distortion at 70mm for both bodies and pincushion distortion for the remaining focal lengths. The 20D distortion values are very good and the 5D values, while less desirable, are also quite reasonable for a zoom lens. Not having a good way to objectively measure the effects of Image Stabilization, we've only shared casual observations regarding it in our reviews. Our experience in using this lens' IS in a number of hand-held "bird" shots was so exceptional though, that we decided to indulge in a little non-quantitative testing. For the test, we chose a low-light situation, a 200mm focal length, and a low ISO (100) to photograph a seasonal ceramic rabbit. (We found the ceramic rabbit somewhat more cooperative than the live ones hopping about the shrubbery.) First, we mounted the Canon 70-200mm f/4L IS - Canon 30D combination on a tripod. A shutter speed of 1/15 sec gave a good exposure with a good-looking histogram, and the photograph (one of three essentially identical images) just below resulted (IS off). Then with the same lens/body combination off the tripod, hand held, with IS on, we took four shots; three were almost identical and one was slightly blurred (even technology can't always overcome 72-year-old shaky hands!). The photograph just below is one of the three essentially identical images. Finally, with IS off, we shot six hand-held IS-off shots. The results varied from quite blurred to almost sharp (one of six). The image just below was selected as a "typical" hand-held image. Because the (spot) focus point was the pink flower just below the rabbit's ear, we selected a 100% (120x120 pixels) patch from each of these three images and from the best hand-held (IS off) image, and a typical hand-held image. These are shown in the table below. Six of six "IS-off Hand-Held" images were much more blurred than the "Tripod" images. Two observations seem appropriate here. First, Canon's claim of a 4-stop IS seems entirely reasonable (1/15 s compared to the standard of 1/200 s). Second, this "photographer" (and I use the term advisedly) is too shaky to get many hand-held "4-stop" sharp images. In fact, I was surprised that even one of the six "Hand-Held" images was tolerable! There's no question that the IS on the Canon 70-200mm f/4L IS delivers dramatically improved sharpness in hand-held shots, easily in the range of a 4-stop improvement over unstabilized images. Big kudos to Canon for this exceptional performance! AF operation with the 70-200 f/4L IS is fast and quiet. In both low- and full-light situations, focusing time from infinity to closest focus (1.2 m) was less than one second except in the most demanding low-light/low-contrast situations, when the lens might take a second longer to focus. Manual focusing works with AF either on or off, a nice feature of Canon's ultrasonic motor technology. When close focusing is not required, a 3m-infinity limited focusing range is available to decrease AF focusing times. This new IS version has the same solid build as its predecessor, the Canon 70-200mm f/4L. The two have almost identical external physical appearances (some necessary switch differences) with the IS version weighing 55 gm more than its predecessor. As with non-IS version, the focal length and manual focus rings are large, smooth to operate, and well-positioned, and the lens shows no tendency towards "zoom creep" when you point the lens barrel up or down. It's clearly L-quality all the way. Figures 10 and 11 compare center sharpness of the IS (black curves) and non-IS (red curves) of the Canon 70-200mm f/4L on both the Canon 20D and the Canon 5D. The two figures indicate that the two lenses perform almost identically on both the sub-frame and full-frame bodies. In the overlap region (f/4-f/16) for these two lenses the Canon 85mm f/1.2L is a little sharper in the center than is the Canon 70-200mm f/4L IS. This isn't surprising because the Canon 85mm f/1.2L is one of the sharpest lenses we've tested to date. Looking at other characteristics, the zoom's Chromatic Aberration is only slightly higher than that of the 85/1.2, as is its shading ("vignetting"). Geometric distortion is the only place that the zoom gives up almost anything to the pricey prime, and even there it's well-controlled relative to many other zooms. Overall, the fact that the 70-200mm's performance is this good relative to a really superb prime is testimony to just how good the less expensive (zoom) lens really is! In the overlap region (f/4-f/32) for these two lenses, the Center Sharpness performance is essentially identical, as is CA performance. Shading and distortion are slightly higher on the zoom, but again not bad at all. Again, the Canon 70-200mm f4L IS (a zoom) holds its own against a very good prime lens. In the overlap region (f/4-f/32) for these two lenses, the Center Sharpness performance is essentially identical, with the zoom just slightly softer at f/4. CA, shading, and distortion are all slightly higher with the zoom, but the differences aren't large. One more time (this is getting boring), the Canon 70-200mm f4L IS (a zoom) holds its own against a very good prime lens. Turning to a more common zoom lens, we see that, while the Canon 70-200f4/L IS slightly outperforms the Canon 70-300mm f/4-5.6 IS over the entire overlap range f/4-f/32, the difference would not be visibly significant if we use DxO's assertion that blur differences of less than 1 BxU are generally not perceivable. (The condensed blur value at each f-value is the average over of the values for 70, 100, 135, and 200 mm. The 300mm values for the 70-300mm IS lens were not used in the averages for the 70-300mm IS.) The 70-300mm's Shading and distortion performance is also very similar to that of the 70-200mm f/4L IS. Where the difference becomes much more apparent though, is in the Chromatic Aberration performance of the two lenses, the 70-200mm doing significantly better than the 70-300. Overall, the 70-300mm f/4-5.6 IS holds up surprisingly well against the 70-200mm f/4L IS, but the 70-200 does have notably better CA performance. In our earlier tests of this Sigma lens, we were impressed with its center sharpness. Its essentially identical performance here with the Canon 70-200mm f/4L IS lens both lends validity to our earlier surmise about the Sigma and reemphasizes the obvious "sharpness" of the Canon. (When you look at the full 3D blur plots for the Sigma though, it's clear that it does lose some corner sharpness at 200mm and f/4, flattening out at smaller apertures.) The Sigma's CA is higher at the ends of its focal length range, but actually better than the Canon at 100mm. Vignetting and shading performance are very similar, the Sigma doing slightly better in the vignetting area. No question about it, the Sigma 70-200mm f/2.8 EX (etc,etc) is a great lens, at a very good price. The Canon 70-200mm f/4LIS does edge it in sharpness across the frame at 200mm, and adds Canon's incredible 4-stop IS into the bargain though. Besides the ones mentioned above, there are a number of other lenses on the market that are comparable to the Canon 70-200mm f/4L IS. Among these are the recently announced (3/7/07) Tamron 70-200mm f/2.8; the Canon 70-200mm f/2.8L IS and Canon 70-200mm f/2.8L non-IS (neither yet tested here); and the Nikon 70-200mm f/2.8G ED-IF AF-S VR. While we tested this last lens (Nikon 70-200mm f/2.8 VR) some time ago,we elected not to include a comparison with the Canon 70-200mm f/4L IS here: In preparing the comparison graphs to show its performance against that of the Canon lens, we felt that the Nikon's center sharpness looked a little anomalous. We're going to ask Nikon for a fresh sample of that lens to re-test and either verify or update our previous results. It isn't easy to improve on an almost flawless lens like the Canon 70-200mm f/4L, unless you add 4-stop Image Stabilization without degrading any of the optical or build qualities. This lens tests and performs as well, or better than, any lens tested recently. It is quite sharp across its entire aperture-focal length spectrum; chromatic aberration, vignetting, and distortion are all quite reasonable; focusing is fast and accurate; the build is L-class; and the new 4-stop image stabilization is downright startling in its effectiveness. The only downside may be the price, which breaks the kilo-buck barrier and is almost double that of the non-IS version. Despite the hefty price though, we expect a lot of non-IS owners will be selling their lenses to upgrade to the Canon 70-200mm f/4L IS -- it's that good. (This might mean that we'll see some of the non-IS models appearing on the used market, which would make that model even more of a bargain.) Very few medicines cure "shaky hands" - this one does, and with fantastic optical quality as well! Wonderful lightweight and versatile professional image tool. Shoot it wide open all day. Sharp images full of life on both full frame and APS-C.
We use our copy of "Little White" to augment a 135L when a bit more reach is needed. It never disappoints, and with the AF on the 5D4 you can use it indoors after the sun goes down. The images are lovely, the AF snappy, and the IS effective. Probably the best performance vs. weight matrix of any tele zoom ever. A classic. This lens is awesome. Sharp, sharp, sharp. It is relatively light and well balanced on the 7D. It is tack sharp at all focal lengths, excellent contrast and colour. For me, one of the best zoom lenses in the market aand it is very comparable to the 2.8 version. But cheaper and absolutly lightweight. Image is excellent at all focals starting from f4. Close up image (at MFD) is very good, except at 135-200mm on my copy. For this situation I use only 70-100mm. The slipping focus is history now after free service. Read all the reviews before committing to buy and was not disappointed, the IS all canon claim and the IQ beyond reproach. WOW this is one great lens..... to me well worth the premium over the older non IS version. Used with a 5d mk111 and f4 no real handicap even when used for sport/ low light. This is one of the best and most versatile tele zoom lens i've ever used. This lens won't give you back pain by carrying it all day long. Image quality is wonderful; at 200 mm, it can give you nice background blur. For candids, this lens shines. Low-light, non-flash photography is where this lens lags behind, but it's an f4 lens. You should've aware of this before you buy it. If you don't need f2.8, this lens will serve you good. I bought this lens for a safari holiday based on these reviews. They are right - it is a fantastic lens. It is relatively light and well balanced on my 7D and I can walk around all day with the camera in my hand. It is tack sharp at all focal lengths, excellent contrast and colour. The IS is magic - I took a 200mm shot of elephants the other side of a lake lit by headlights at night at 1/6 seconds. I use it for bird photos with sharp crops of the central 600x600 pixels. There is absolutely no degradation in the centre with the 1.4x Mk III extender. It's a wonderful lens, which I use whenever I can. The f/2.8 MkII might be even better, but it is huge and I could not walk around with that all day. I compared it with a 100-400mm for bird watching, and that huge airpump at 400 mm was not quite as good as the 70-200mm at 200mm resized by 2x with Photoshop. Best zoom lens in Canon's lineup.Just buy one! Sharp, sharp, sharp! Solid build, weatherproof, fast AF. This is my first L lens and after deliberating on whether to go budget with the 55-250mm IS, I'm glad I chose the 70-200f4L IS. This is incredibly sharp throughout the zoom range, I'm no pro but even I can see the quality on almost every shot and achieve numerous quality keepers with this lens. the IQ that this lens provides is second to none. If your looking into purchasing this lens I say go for it, you will not be disappointed at all. tripod ring and hood were included. I also purchased the 1.4 extender and compliments this lens very nicely...you simply can not go wrong. Conventional wisdom tells us that primes are sharper than zooms. So much for conventional wisdom. I have never owned a lens sharper than this one. I owned the non-IS version previously and that was a great lens. This one is even better, and the 4-stop IS feels as if a giant pair of hands have come down to steady the camera. Look through the viewfinder with IS off and everything keeps wobbling around. Press the shutter half-way to activate the IS and everything just freezes. The IS technology used in this lens is a big advancement on earlier versions. My keeper rate with this lens is so high that I find it almost impossible to take a bad photo. There is no 'technique' to learn, as is the case with some lenses. It is a joy to use. The focal range is very useful for general use and the lens is easy and light to carry around. The 70-200 f/2.8 lenses get great reviews but they are big and heavy beasties compared to this one. If you want a bit more range, add a 1.4x converter. This combination works exceptionally well and you will be hard pressed to see any deterioration in image quality. I'm gradually building up a collection of lenses that perform flawlessly. This is one that I prize highly. I can't imagine wanting to part with it for a very long time to come. Many people seem interested in the non-IS version as a way of saving money. The non-IS version is very good but after you've used the IS you won't want to be without it. I strongly believe the extra money is well spent. The lens comes with a hood and case but no tripod ring. However, because the IS is so effective I have never seen the need to use a tripod. The pictures it takes are as good as the numbers and graphs show above. The IS is pretty amazing at 200mm and the pictures turn out stunning! You can't go wrong with this lens. My bag is already above 10kg. Will I add 750 more grammes to gain one stop less ? The former 70-200 has to be closed to F/4 to match it at the same aperture. This lens is just great! Its light with superb quality. I use this on my 50D and I just love it. Sharpest telephoto zoom in the market. IS works like wonder. Lightweight despite the focal length. This lens is worth every penny. Canon’s top of the line lens with outstanding performance, but of course with a hefty price tag. Excellent sharpness across the entire focal range, with very fast focusing. Solid bulletproof body design with weather proofing to an extent. The ‘IS’ really helps when shooting outdoors handheld without a tripod. The only downside is that ‘f4’ may not be as fast as its ‘f2.8’ counterpart in low light conditions or action photography. Also, in spite of this being an ‘L’ lens Canon does not supply a tripod collar along with this lens. It has to be purchased separately. Tripod collars can give extreme stability to such kind of lenses when used on a tripod. I use a 20D. This is my favorite lens. Sharp, wide open across the full zoom range. The stabilization system works beautifully. Focus is fast and accurate. I also use this lens for macro photography with 1.4x EF II TC, 36+20+12mm Kenko extension tubes (68mm total), tripod ring, monopod, and small quick release head. Corners go a bit soft, but center remains sharp. I order this massive stack as follows: 20D->1.4x->36->20->12->70-200 f/4 IS. The stabilizer seems to help in the configuration, but I haven't done detailed analysis to confirm. The biggest difference between 70 and 200mm macro (using the above setup) is the working distance. At 200mm front of the lens is more than 1 foot from the subject. At 70mm it's just a few inches. This lens is awesome. Canon nailed it on every front. Incredibly sharp and contrasty at all apertures. Fast focus, with no hunting. It balances nicely on a 40D and you can carry it around all day without a neck ache. This is becoming my favorite lens. I really think it is as sharp as any of my primes and the IS is the icing on this delicious cake. This lens continues to amaze me. Even though it's a little long on a crop body (XTi & 40D) I find it's the lens I use the most, even when I just going out for a 'walkabout'. With this lens, I know if I encounter a special shooting opportunity, this lens will deliver. I can shoot handheld at 1/15, and my hands are n ot that steady. Focus is fast, almost as fast as my 135L. It never hunts back and forth through the zoom range. The focus limiter switch probably helps in this regard. Some people have complained that this lens isn't at it's best at minimum focus distance and F/4. Just take a step or two back, to 7 or 8 feet, and it's fine. I rarely shoot at minimum focus distance. I do wish Canon would either make the lens hood white to match the lens, or make the lens black to match the hood. I think my 135 F/2L looks better, with it's black color/black hood, on my gripped 40D, but once you see the images the 70-200 produces, you realize it could be bright purple and you would still use it every chance. Highly recommended. It will last a lifetime. I am looking forward to shooting with it on the 5D Mark II, if my pre-order ever arrives. Maybe the best ZOOMlens in the market,the most sharpness zoomlens in canon system.Very good color and construction quality.IS is really useful too.Smaller and Lighter than the 70-200 2.8.Maybe the only insufficient is the price.Nearlly twice to the 70-200F4.But it is more sharpness than 70-200 F4.TO this , I think the price is fair. An astonishing lens. I owned an earlier version, not IS, which I sold due to non-use. This version is simply an amazing lens - sharp, stunning color, easily handheld. Would recommend to anyone. Only downside is 4f - but when you move to f2.8 it becomes MUCH heavier, bigger, less sharp (I also owned 70-200 f2.8 and chose to keep this over it). This lens does indead compare very well with prime lenses. The measured MTF values are very similar to the 100mm macro. The one area where it fails to impress is at its close focus distance. In fact below 5 feet the image quality is very poor - MTF about 1/3 of its value from infinity to 5 feet, effectively useless. To use the lens for close-up work, simply attach either extension tubes or the 500D closeup lens (via a step-up adapter ring). Either of these methods allow the lens focus to be positioned near infinity and the quality is restored. fast AF (although not as fast as my 85f1.8), sharper than all primes in this range. Although this lens is almost perfect optically , I sold it for a couple of small lenses (85f1.8 and 100f2) because it was just simply too conspicuous and bold. I was arrested in Burma and other places for this . I love the quality of this lens but I can not have it because it got me arrested or my face punched a few times times . When you are working as some kind of travel photog for a mag or like that , you some times need to be in dangerous places like Burma or Iran , and you are not safe with a white lens there. That said , if I were shooting landscapes or day light sports , or even some portrait as a hobbist , I love this insanely sharp lens, though, I think people especially L snobs are too obsessed with resolution chart sharpness and forget about anything else. If I were a hobbist and printing out no bigger than A3 , I will buy an EF-S55-250IS(just very sharp and light , though not as contrasty as this L lens). But for pro sport in day light or landscapes in night(IS gives me about 5 stop advantage, so when I usually need ISO1600 , I can use ISO200) , it is a super lens because of the Af and weather-sealing. Just not use it in Burma. Exceptional in all respect, a perfect 10! Its like having multiple primes in one package!! Missing tripod collar, if your style of work require lot of tripod use, then buy one. the white color barrel . nothing to complain about it or can not complain anything about it other than the color of its barrel. I wished it had been a black lens. I hope Canon will make a black version of it. This is the sharpest lens in the world in all mounts. I tried all similar lenses , and I am sure this is sharper than most of primes in real life use with its 5 stop IS , it is better than what Canon says of it , is a 5 stop IS for me than 4 . I am thinking of painting it with black color stuff . great IQ, the resolution , the AF , the color all fine. So as I am a travel photographer for a mag , I now , use the 70-300DO instead and now , nobody gets scared of me shooting them and I can get natural real smile of people. It does not matter how sharp it is if no body smiles at it . That said , if I am shooting an animal or landscape (which I do not like to shoot ,boring to me),it is the best lens to go out with. The best zoom on the market and the best thing ever made by Canon! What a lens. IQ is fantastic: sharp to the edges from wide open, wonderful contrast and colors, no ca, no flare.... The resolution is so high, that on my 30d I often see jagged pixels on diagonals at 100% view. Last weekend I took some flower pics, and the colors were wonderfully rich and saturated even in Neutral Picstyle. I have compared this to the marvelous 200/2,8 L, and the zoom is better by far in the corners down to f8,0. In the center there is no visible difference. Only in use with a TC the prime wins in the center, but again loses in the corners. My only (small) niggle is, that the AF hit rate seems to be not as high as with the prime, probably because the special AF-Sensor of the 30d is only actitvated with f2,8 lenses. Still this far from a problem, just that from time to time the AF is a bit off (not systematically). IS is good, 1/15s is possible with luck. I just bought the lens a few weeks before Cashback began in Europe, which is a pity, because now it would cost me EUR 200 less... and for (now) 880 Eur after CB this lens really is worth the money. Most Highly Recommende! A tad expensive, but worth every penny if you have seen the results! I used to own both the 2.8/70-200 (very sharp) and its IS brother (a little less sharp, especially wide open) which I sold for this lens - and this one is the best so far, even on my full frame 5D! The IS works really well, and lens is a pleasure to carry around all day, especially in comparison with its 2.8 brethren. Pros: Extremely sharp at all combinations of focal length & aperture even at the corners, extremely fast & accurate AF, great "L" build quality & handling, state-of-the-art 4-stop IS, constant aperture. Cons: What cons?? There is none. If you want to nitpick: maybe a case could be made for the price, it could be a tad lower. The lens hood should have been petal-type like those used in the f/2.8L versions. Also, the tripod mount should have been included considering the price, although it's not that essential since it's not as heavy as its f/2.8L siblings. Everything you've read about this lens is true: it is the sharpest Canon zoom lens made to date. Its delineation & contrast is equal to or even superior to most primes, including the L ones. This lens was designed to be shot wide open, it improves little when stopped down. It has something that even both the f/2.8L versions don't have: a Fluorite lens element, which has optical characteristics unachievable with ordinary glass. Fluorite was previously used only with super-tele L primes & a couple of older L zooms (the 70-200 f/4 non-IS is one of them). This lens is destined to be regarded as one of the best Canon EF lens, zoom or prime, ever made. excellent sharpness, light weight, tough building quality. It's a solid, tack-sharp lens at all focal lenghts and f/stops. The light weight makes it an exellent solution for travels, even if this version does not have an IS system (I would dream to try the new version, but it's 400 $ more just for the image stabilization!). I changed it when I decided to try the Canon 70-300 DO IS, but this was one of the worst changes I could have made. IQ, lightweight, build quality. Oh and outstanding IS. I got this lens about a month ago and have taken a few hundred images with it. Thus far I have been amazed by the IQ. It's so sharp! The bokeh is smooth, maybe not as smooth as the 2.8 version, but I didn't really see myself needing that lens as I do most of my shooting outdoors. The build quality almost makes my 400D look like a toy when they are attached. Great travel lens, I am in Japan on vacation as I type this and other than being very noticeable I don't worry about it at all. Very solid. The IS also works very well. It lets me take much lower light and longer zoom shots hand held than I could ever have without it. It's a great lens and I would definitely recommend picking it up if you want a lens in this zoom range and want the best available. I have only used the highly regarded non-IS 70-200mm f/4 briefly, but was very impressed with its IQ. This new image-stablized version delivers IQ that looks every bit as good: the same gorgeous contrast and colour; and it's very sharp as well! I do a lot of low-light shooting, so the hefty premium for image stablization is worth it to me. I'm getting sharp handheld pictures at 1/15 second at 200mm on a crop camera. Canon is advertising four stops for its latest IS technology; based on my experience, they're not exaggerating.